Selling your home can be a difficult feat, especially if you are putting it up on the market during the winter months. If you need to sell your home in Huntsville, Alabama before Christmas Day, then you should implement the following 12 tips to get your house sale ready in just 12 days. It may seem like the most price savvy decision to choose a cheaper agent, but you may end up not selling your home. You need to focus on choosing the right agent who proactively tries to sell your home, allowing you to review the agent’s marketing and advertising approach. You should review comparable homes that have recently sold in your Huntsville neighborhood and set your price 10 to 15 percent below the competition. Set the sale price at a value you are comfortable negotiating with because many buyers are searching for the best deal on the market within their price range. Most buyers want to purchase a home that is move-in ready, which may require you to fix up your home before listing it. Touch up the paint color in all your rooms, and replace any broken door knobs or handles. Buyers want to purchase a home in good condition, so don’t give them a reason to look at other houses on the Huntsville market. Potential buyers need to picture themselves living in the home, so you need to de-clutter all the rooms, requiring you to pick up excess toys and trinkets. Do not stuff junk into closets because buyers will be looking for available space. Arranging your furniture is essential to making your house look its best, showing off key pieces that stand out. Stay away from too much furniture, too little furniture, or poor traffic flow when www. 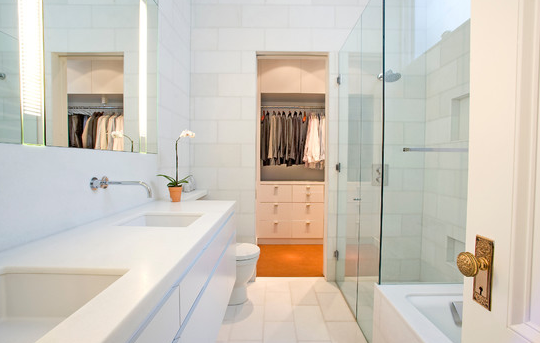 Bathrooms are a huge selling point for buyers, so remove any personal items and clutter on the sink, cleaning everything until it shines. Choose a neutral or relaxing paint color, and update any fixtures. Small upgrades that cost a couple dollars and provide a large return in investment. Staging the kitchen is essential to attracting home buyers. Clear off the counters and clean the sink and stove of any food particles. Replace any fixtures and cabinet knobs that need updating. Even in winter, Huntsville is beautiful, but you want your home’s curbside appeal to attract buyers. Rake up dead leaves, trim up bushes, and cut the grass to give your home a clean-cut appeal. Give your house a homey feel by adding touches of the season to both the exterior and interior. Decorative pieces, such as a door wreath or scented candles, appeal to potential buyers. Make sure to stage your house before the open house, advertising the date in the newspaper and online. Set up a snack station with crackers and cheese or another tasty treat. This is a time when buyers can look around your house and see if it would be a good fit for them. It’s often advisable that you are not present, as buyers don’t want to worry about you looking over their shoulder as they comment about your property. If no offer is made on your home after an open house, you should review the buyers’ feedback with your agent and adjust the price as needed. Talk to your agent about changing the selling strategy to bring in more buyers.